Want a way to add value to your home and actually enjoy it? Consider building a deck. 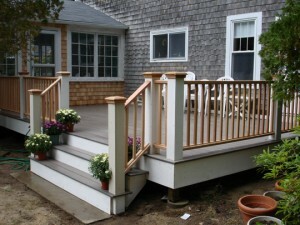 A deck is a very versatile addition to any house. It can be used for grilling and outdoor dining, entertaining friends, stargazing, observing nature and just plain relaxing! Furthermore, a deck can be covered providing shade or it can be open for those who love the sun. You may wish to hire an experienced professional such as a builder, contractor, carpenter or remodeler to build a custom deck for you, or you might decide to tackle the project on your own. Either way, building a deck can be rewarding. Working with a professional will ensure custom touches that you might not be able to create, build or accomplish on your own, while building the deck yourself can be rewarding and offer the satisfaction of completing the job. If you do decide to build the deck on your own, consider purchasing a woodworking or deck plan. They are available online in a variety of sizes ranging from a basic platform with railing to more detailed deck designs that might include built-in wooded benches for seating, plant shelves, a built-in barbecue area or even a hot tub. No matter which route you take, you’ll be pleased with the new deck you can enjoy year-round and feel confident that you have just added value to your home.